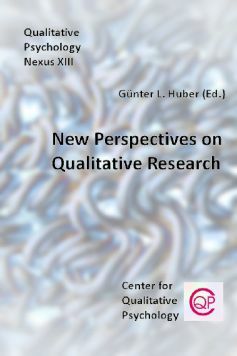 Volume 13 of the "Qualitative Psychology Nexus" on "New Perspectives on Qualitative Research" presents selected contributions to the meetings in 2014 and 2015 organized by the Center for Qualitative Psychology. "How to Publish and Disseminate Qualitative Research". It took place from March 28-30, 2014 at the University of Education Weingarten, Germany, and was organized (in the order of the original announcement) Prof. Dr. Karin Schweizer, Dipl.-Psych. Fabian Jobst, and Roswitha Klepser. "Reflections on Methods of Qualitative Research". The participants met from February 26-28, 2015, at the University of La Laguna, Faculty of Education (Tenerife, Spain). Members of the organization committee were (in the order of the original announcement) Manuel Avelino Pestano Pérez (La Laguna University), Mechthild Kiegelmann (Karlsruhe University of Education, Germany), Olga María Alegre de la Rosa (Dean and Chair in Education of La Laguna University), Sálvora Feliz Ricoy (Polytechnic University of Madrid), Tiberio Feliz Murias (UNED), and Roswitha Klepser (University of Education, Weingarten, Germany). The contributions to volume 13 of the "Qualitative Psychology Nexus"are arranged in five main sections starting with an overview on trends and challenges in qualitative research and then following the phases of research in general. Two articles each deal with questions of collecting qualitative data (section 2) and analyzing qualitative data (section 3). Then four papers describe the issues of applying findings of qualitative research (section 4). Finally, suggestions how to publish qualitative findings are outlined in section 5.